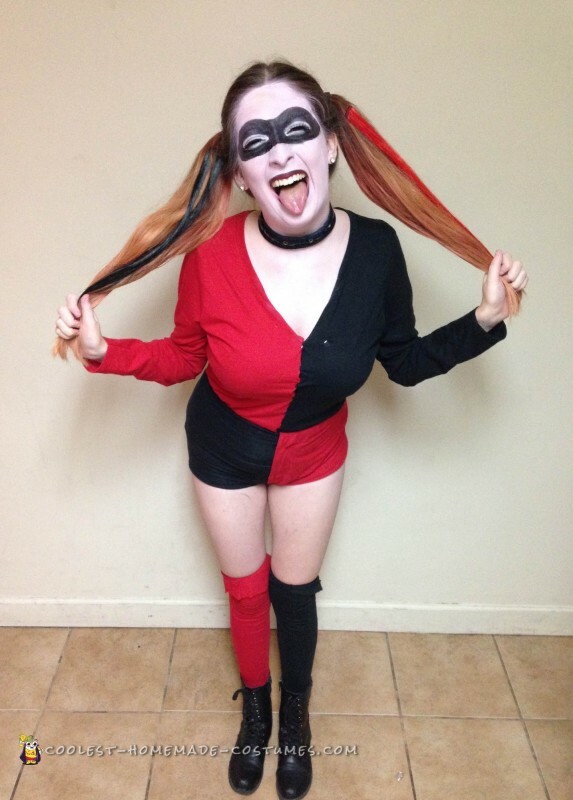 Of course I had to be Harley Quinn for Halloween this year! I love her as a character because she is crazy and fun. 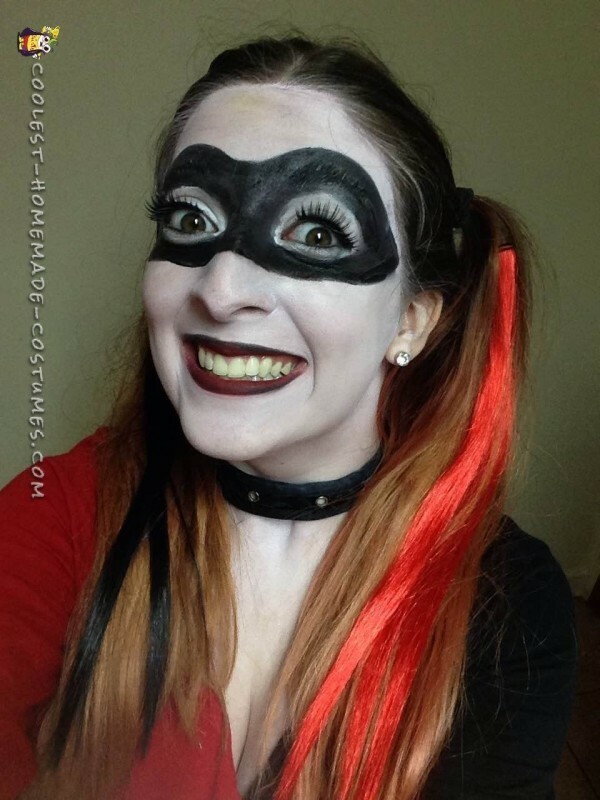 With the suicide squad movie coming out next year, I dressed as her to show my excitement! However I chose a look more similar to the comics than to the movie. For someone who doesn’t know how to sew, I am quite proud of how I made this costume without even picking up a needle. I bought two long sleeve t-shirts, one red and one black. I cut them in half horizontally and vertically. I reversed the colors on the bottom half so they alternate with the top. Then, I flipped the top half inside out and pinned the seams with safety pins. Once that was done, I reversed it back and put it on. I pulled black spanks over top of my shirt and tucked in some extra red t shirt fabric and secured it with some safety pins. I cut the sleeves off of the unused halves of the shirts and used them as high-knee socks. They kept falling down so I rolled ponytails above my knee and tucked the top of the sock over the ponytail. I bought red and black hair streak extensions and clipped them in my ponytails. I found a black leather choker in my costume bin which I found to be suitable for the character. To finish up the costume, I applied a base of pale makeup, and a mask of black makeup. Overall, the costume was only around $15. It was easy to make and ended up looking very cool! I am proud of my work. My boyfriend dressed as the Joker, so we were the ultimate supervillain couple. We love Halloween and dress in multiple costumes per year, but this was definitely one of our favorite costumes.